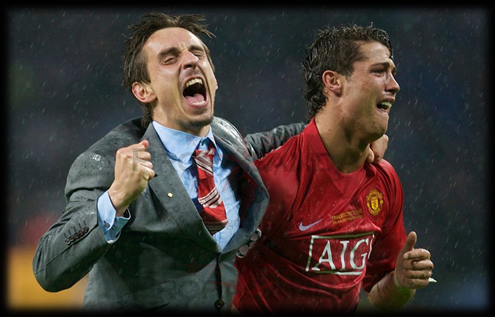 13.03.2011 » Gary Neville: "Cristiano Ronaldo is an incredible player"
One of Manchester United living legends, Gary Neville, confessed his admiration for Cristiano Ronaldo. The former "Red Devils" captain said that CR7 is one of the best players he has ever seen. Neville also believes that Nani will follow Cristiano Ronaldo footsteps. He's playing for Manchester United for over 20 years, and there he met the Portuguese players Nani and Cristiano Ronaldo. Gary Neville followed both players development very closely and he believes that Nani can follow Ronaldo's footsteps, who now plays for Real Madrid, as everyone knows. Gary Neville: "It's hard to reach Cristiano Ronaldo level, which really is incredible, but I think Nani is heading the same way. I've played a few years literally looking Cristiano Ronaldo from behind, since he always played upfront on the wing. In the first two years at Manchester, he really was a totally different player than what he is today. He had a fantastic development and I believe Nani can do the same. He is physically strong, knows how to create chances and he's able to score them. He also knows how to dribble, so I'm pretty sure Nani is going the same way as Cristiano Ronaldo", said the former Manchester United captain, when visiting a Carlos Queiroz football/soccer school, in Carnaxide, Portugal. Gary Neville still remembers the first time he saw Cristiano Ronaldo playing, in the "Estadio José Alvalde XXI" opening game between Sporting and Man Utd, back in 2003. "I didnt play that game, but I saw it on the TV and I must say I really got impressed (it was reported that Manchester United players were so amazed by Cristiano Ronaldo performance, that in the end of that match, they asked Sir Alex Ferguson to bring the Portuguese player to Old Trafford). Then I worked with him every week and he truly is an incredible player. He's one of the best I've ever seen and Portugal is lucky to have him. It's rare to see someone with such quality. Cristiano Ronaldo is a phenomenon. I'm 36 years old, and he's obviously a lot younger than me, but I have to respect him. Players like Ronaldo make us feel younger, and always have the will to play, because they do so many incredible things on the field." When asked to compare Lionel Messi and Cristiano Ronaldo, Gary Neville couldn't pick one: "They are both amazing and the world of football is lucky to have them." The former Manchester United captain also talked about the recent injury that Nani was victim of, in the match against Liverpool, as a result of very hard tackle from Jamie Carragher: "Obviously it wasn't a good tackle and Jamie knows it, but those things happen in football." You can watch Real Madrid vs Olympique Lyon livestreams this Wednesday, here on ronaldo7.net. Links will be updated around 30 or 60 minutes before the match starts.